REPENTIGNY - Former reputed New York Bonanno family crime boss Sal "The Ironworker" Montagna was killed Thursday morning in Charlemagne. Montagna, 40, was known as the "Bambino Boss" and had returned to live in Montreal in April 2009 after being deported from the United States. He was also known as"Sal the Ironworker" because his family owned a metal company in Brooklyn. He was born in Montreal but spent much of his youth in Sicily, the same area of southern Italy that's the homeland of the Rizzuto family, which has been targeted in a series of recent underworld slayings. Repentigny police and the Surete du Quebec responded to gunshots that rang out in a suburban district of Ile aux Tresors at 10:15 Thursday morning. Several witnesses said they also heard the sounds of breaking glass. They saw a man running away from a white van and jumping in the river. Police officers who rushed to the scene said the man fell into the river and was unconscious when they pulled him out. 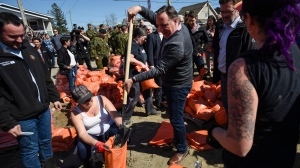 The event took place on Ile Vaudry St. near Celine Dion St. on Ile aux Tresors, a suburban area set on an island 33 kilometers northeast of downtown Montreal. In September 2002 Montagna, a married father of three, refused to testify before a grand jury and was sentenced to five years probation and as a result was ordered deported back to Canada. Canadian officials could not legally refuse to allow him to return. Montagna's return to Montreal coincided with the start of a series of murders of Rizzuto-related clan members. It has been speculated that Montagna hoped to fill the leadership void by taking over the local Montreal Cosa Nostra, which has long been believed to be controlled by the New York-based Bonanno gang through the Rizzutos, although that grip is believed to have weakened in recent years. -Federico del Peschio, 59, killed in August 2009. -Nicolo Rizzuto Jr., 42, shot to death in December 2009 in NDG. -Paola Renda vanished in May 2010 and is presumed dead. -Agostino Cuntrera, 66, was killed in June 2010 along with his bodyguard Liborio Sciascia, 40. -Nicolo Rizzuto Sr., 86, was assassinated by a sniper at home on November 10, 2010. -Lorenzo Lopresti, 40, was shot dead on his balcony in St. Laurent on October 26, 2011.